Martina is passionate about interior design, especially bathrooms. independent showrooms and larger, national organisations and her enthusiasm for design is infectious. Having previously managed the well-known Ripples showroom in Oxford, Martina is proud to run InStil Design with her business partner, Lynne Delavere since 2012. 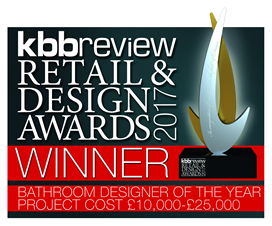 Her bespoke steam room made her Bathroom Designer of the Year 2017: project cost £10,000 - £25,000. Her designs were selected from bathroom installations across the UK and Southern Ireland, as examples of excellence in Bathroom design. In 2015 InStil Design was one of four finalists for the National Bathroom Retailer of the year award.The Retailer of the Year awards are for the best all round retailers looking at factors including business success, marketing, showroom, customer service and after-sales. Although formerly trained in Furniture design Mark enjoys a career of over 10 years in Interior design specifically in the hospitality industry of Bars, Cafes & Restaurants. Experienced in creating full fit out drawing packages, surveying and presentation drawings in Auto CAD Mark brings his detailing ability for in-depth projects to InStil Design. "Martina Landhed's design skills are excellent. She took a great deal of trouble over accommodatiing our needs and preferences and we have ended up with two beautiful, modern and stylish bathrooms. We would highly recommend InStil Design"
"InStil have been fabulous. Karen listened to our quite vague requests and somehow managed to interpret our ideas to produce a perfect design. Simon, who installed everything is a superb craftsman. We are delighted with the final result - which looks exactly as per the illustrations Karen produced with her design software. We would recommend InStil without hesitation. Great service from start to finish - thank you"